Envirofill – The Best Infill for Your Artificial Turf. Ever. In the beginning of infilled synthetic grass, there was a void, a multitude of space between the fibers where a “synthetic soil” belonged. It was decreed that rubber, ground from tires, could serve as the infill material for that turf. And the athletes who played on that first generation of turf saw that it was good … until their revelation that the granules bounced around, and under full sun the black rubber absorbed heat of biblical proportions. This begat the introduction of raw silica as infill … which led to an epiphany that mere sand was abrasive like sandpaper, compacted hard, limited drainage, and absorbed all that the family dog dropped onto the turf. And it came to pass that to deliver artificial turf from these evils, a different infill was needed. 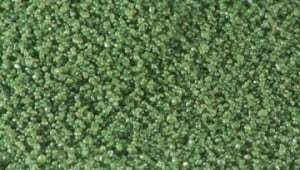 And so Synthetic Grass Warehouse introduced Envirofill: the cool, clean and pet-friendly granules that make even non-believers sing its praise. Envirofill, composed of rounded quartz core mined from the Hickory Formation in central Texas, is specially designed for use in artificial turf. It looks and feels natural and is warranted to perform for 16 years. Envirofill is also manufactured with Microban antimicrobial product protection to inhibit the growth of bacteria, mold and mildew that can cause odors and even staining. Unlike rubber, Envirofill stays comparatively cool in synthetic grass; its heat-reducing properties lower surface temperatures by as much as 25%. Envirofill’s mass stays securely in the turf pile without bounce or static cling, and its properties remain stable in even in the harshest weather conditions so your lawn is always a comfortable and beautiful place to relax or play. Envirofill’s complimentary green hues provide a more natural appearance in synthetic grass than black rubber — no “five o’clock shadow” effects. It’s also non-toxic — no worries about what those recycled tires picked up on the asphalt of Interstate 40 between Barstow and Amarillo and what got dumped in your backyard. Unlike raw silica, Envirofill is non-abrasive, so children can play and slide on the surface safely all day. Its manufactured-round profile also makes it easier to install than the pointed edges of common sand. Envirofill’s quartz core and round shape resist compression so it won’t compact like a sandcastle at the beach and harden like cement, or prevent water from passing through the turf system. There’s no airborne silica dust associated with Envirofill, and the product is exempt from California’s Proposition 65 product safety standards protecting people and animals. Envirofill offers unsurpassed protection for pet turf applications. Other infill materials can retain moisture – and where there is moisture, there is mold, mildew and odor causing bacteria. Non-absorbent Envirofill infill with Microban technology helps prevent microbes such as odor causing bacteria from breaking down pet urine into pungent ammonia smells. When a dog “does his business” Envirofill rinses clean and promotes proper drainage for a cleaner surface for rest or frolic. Envirofill is durable and has been tested for safe use. The turf can be reused and repurposed after the life of a turfed lawn so it won’t be clogging up a landfill. For the synthetic grass consumer or landscaping professional seeking a worry-free material with performance characteristics plus durability , history of safe use and demanding guaranteed quality –Envirofill is a heaven-sent infill. https://syntheticgrasswarehouse.com/wp-content/uploads/2012/01/durafill-300x170.jpg 170 300 SGW Staff https://syntheticgrasswarehouse.com/wp-content/uploads/2018/03/sgw-logo-large-copy-300x120.png SGW Staff2012-01-31 18:42:002012-01-31 18:42:00Envirofill - The Best Infill for Your Artificial Turf. Ever.